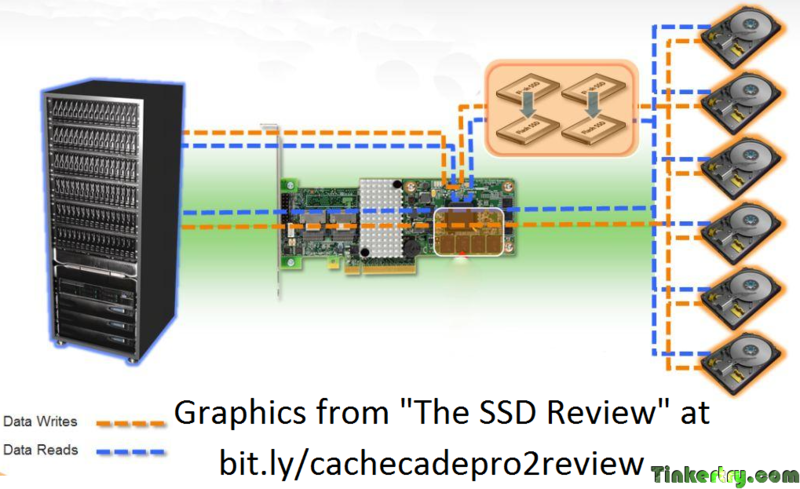 "RAID controllers with >2TB drive support, 6Gb/sec (SATA3) support, and various levels of SSD caching: results of my taking both the LSI 9260-8I and the Adaptec 2405Q out for a spin"
Kind of a mouthful, eh? Hopefully my new title is both more concise and intelligible. The title is the easy part. This is going to be a rough/deep ride through the quagmire of new RAID technology intricacies. Hang in there, this epic journey is not for the faint of heart! Making a reasonable cost, large storage array that also performs well is a challenge. Ideally, I'd like to serve up some speedy NAS style workload (NFS, iSCSI, CIFS, etc.) to all my lab machines. So, with this post, I'm finally beginning to write up some detailed information about my recent tests of the Adaptec 2405Q with maxCache, and the LSI 9260-8i RAID controller with CacheCade. Both are SSD read caching technologies. I guess you could say I caught the bug when I was using a Seagate Momentus hybrid drive this past winter, thinking, wouldn't it be nice if my RAID arrays performed more like my affordable and large hybrid drive? And was operating system agnostic, that is, didn't require Windows-only software to run? My posts about this RAID shopping began way back in May 2011, over at this spot on the extremely helpful homeservershow.com/forums. Since ESX 4.1 Update 1 doesn't have Intel Z68 motherboard SRT (Smart Response Technology) support with SSD caching, I'm seeking alternatives to speed up the performance of all my VMs. I've always found testing RAID performance to be complex and time consuming process, especially when you sprinkle in my desire to try out the latest and greatest techniques of making a RAID array perform more like a hybrid hard drive. Think of a cross between SSD and a traditional spinning platter RAID arrays, taking the best of both worlds and mushing them together. In a perfect world, this would get you speed, capacity, and resistance to data loss from inevitable drive failures. Notice, I stated I want my choice to be VMware ESX compatible, which really limits choices even further, as seen over at the VMware Hardware Compatibility Guide (which doesn't yet have ESX 5.0 info). I don't wish to dedicate this storage chunk to just one system or virtual machine, and with ESX 5.0's support for >2TB volumes, I'd like to manage this big lump of roughly 10TB of storage with ease. I know I'll change my mind many times on how to carve things up over the next 4 years of expected life of this system. And just to make the picture even muddier, I'm also very interested in the upcoming "Host Cache Configuration" setting in ESXi 5.0, but that appears to be no substitute for true caching of a VM's "hotspots." Playing with that software cache will have to wait, and there's very little info out there yet anywhere Googling, and of course, vSphere 5.0 (with ESXi 5.0) isn't even shipping yet. So, back to the here and now. At first, I was excited at the idea of CacheCade 2.0, since I already have a 9260-8i. But LSI claims to be the first vendor to offer this, hmm, I'm used to being on the bleeding edge, but not necessarily with my treasured storage, at least until I have 2 or 3 copies of everything critical anyway. So that means you may need a lot of SSDs, so I may need to re-visit exactly how LSI's flavor of RAID10 caching works. But I'm finding no new MegaRAID instruction manual yet, that'd be too easy. The issue with multiple SSDs is cost of course, my RAID5 config in my vZilla build has 7 (2TB) drives and 1 (96GB) SSD drive. Time for even more research. I will make updates right back here in this post, when I learn something significant, or have some speed tests of the 9260-8i with the new LSI August firmware/drivers.